Struggling to entertain them at home? 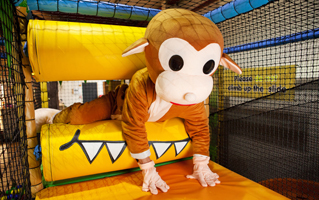 Head down to Jungle Jack's and let your little monkeys run wild, have a blast and burn off some of that energy. Our purpose-built play-frame provides over 1,700 square feet of fun including challenging climbs, a rope bridge, our astra-glide slide, crafty crawl tubes and peekaboo bubble windows. Daredevils will love our super-fast racing slide and spiral tube. 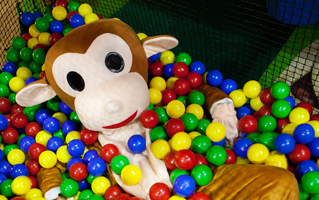 There's something for everyone at Jungle Jack's, including a dedicated baby and toddler area where the young ones can play safely. You'll find ample seating, a well-stocked café and free WiFi waiting for you here, so you can kick back with a sandwich and a hot cup of tea while the little ones get stuck in. 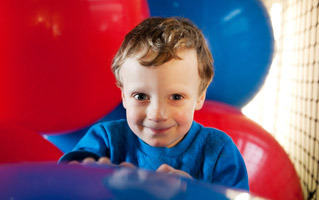 Our seating area has been carefully designed so that you can see the whole play area and keep the kids in your sights. Organising birthday parties can be a logistical nightmare. But luckily, you can take the easy option and grab a Jungle Jack's birthday bundle. We have our own Jungle Tree-House party room for hire, an exclusive area over-looking the play centre with a party package to suit everyone. This includes 90 minutes of soft play followed by 30 minutes of party room fun. We provide hot and cold party buffet, unlimited squash, ice cream and when its cake time you might even get a visit from Jungle Jack himself! Turn up, have a blast and make the birthday boy or girl feel like a superstar! And let someone else worry about the cleaning up. Jungle Jack’s Snack Shack is open all day, so you don't have to come loaded with drinks and snacks: we've got you covered. Freshly ground Fairtrade coffee, steaming mugs of tea, authentic Italian hot chocolate, fruit pressés and soft drinks are all available, as well as a fantastic food menu for all tastes. From cakes and scones to sandwiches, paninis, burgers, pizzas and jacket potatoes, we can satisfy every appetite. A full children’s menu and some delicious veggie options are available too. We've thought of everything!